The turnip (Brassica rapa) is a vegetable found in many home gardens throughout the United States. Since it is a very hardy plant of rapid development but does not thrive in hot weather, it is usually grown either early in the spring or late in the fall in the North and as a winter crop in the South. Although the large rosette of coarse, roughish leaves is sometimes used for "greens," turnips are usually grown for their enlarged fleshy roots. The upper portion of this enlargement to which the leaves are attached is morphologically a stem. During the second year of growth, or late in the fall of the same growing season, if planted in the spring, it produces a large, branched flower stalk 1 to 3 feet in height. Thus the turnip is either an annual or a biennial. The Purple Top Globe turnip was planted June 16, 1 month too early for its best development, in rows 16 inches apart. After the plants were well established, they were thinned to 6 inches distant in the row. By July 10 they were 5 inches tall and had 5 to 7 leaves each. The five largest were 3 to 4 inches long and 2 to 3 inches wide, thus presenting a rather large transpiring and photosynthetic surface. Early Development.--The turnip is characterized by a strong taproot which was at this time 5 millimeters thick at the ground line but soon tapered to a diameter of 1 millimeter or less. It pursued a somewhat tortuous downward course, making gentle curves through an amplitude of 1 to 3 inches. Depths of 30 to 32 inches were attained by the taproots, the last 3 to 4 inches of which were unbranched. The first 2 inches of taproot were also free from branches; there were 9 to 10 laterals per inch on the next 4 inches on typical plants. Below this they varied from 6 to 12 per inch to near the root ends. Thus a total of 200 to 225 branches occurred on a single plant (Fig. 41). Fig. 41.--Taproot system of Purple Top Globe turnip in its early development. It may be noted that most of the laterals in the surface foot spread somewhat horizontally. At greater depths some ran more or less horizontally to only 1 to 3 inches and then turned downward. The longest branches and greatest lateral spread (about 14 inches) occurred in the first foot. Practically all of the laterals were clothed with rootlets less than 0.1 to 0.3 inch long at the rate of two to five per inch. On the largest laterals they were longer and often much more abundant. Where they exceeded 1 inch in length, branches of the third order were found at the rate of three to five per inch. Thus an extensive absorbing surface was already developed. Midsummer Growth.--On July 27, a second examination was made. The tops were 1 foot high and each plant had about a dozen leaves. At least eight of these averaged 8 by 5 inches in length and width, respectively, although some leaf blades were nearly 1 foot long. Correlating with the growth of tops, the roots too had made a marked growth. A maximum lateral spread of 2 feet had been attained and many of the taproots reached the 4-foot level. Thus the root system nearly doubled in depth and lateral spread (Fig. 42). The taproots were now about 0.8 inch thick but usually tapered to 2 millimeters or less at the 6-inch level where they were scarcely larger than many of the major laterals. As a result of recent showers, thread-like but very profusely rebranched laterals filled the surface soil. Although only 1 to 1.5 inches long, they were rebranched to the third order. The number of lateral roots had greatly increased, more than 100 usually being found on the first 12 inches of taproot. Fig. 42.--Root development of turnip on July 27. Frequently 12 to 18 major laterals originated at depths of 3 to 10 inches. As before, these ran outward in a generally horizontal direction, some ending at distances of 9 to 18 inches from their origin. But perhaps more frequently they extended outward and then turned rather vertically downward, frequently reaching the 3-foot level. Still others, especially those originating between 6 and 14 inches, ran obliquely outward and downward thus occupying the soil nearer to the taproot. Below 14 inches few long branches arose from the taproot, but it was clothed with an abundance of short roots (0.5 to 4 inches long) which usually occurred at the rate of about 10 per inch. Branches on all of the laterals were abundant; 8 to 12 per inch were common and sometimes there were as many as 15 to 20. Many were hairlike, others were larger and 2 to 18 inches long. They extended in all directions and gave rise to sublaterals which were often 3 to 5 inches long and themselves rebranched. In fact the network of rootlets was frequently so dense as to form brushlike mats which thoroughly ramified the soil for water and nutrients. 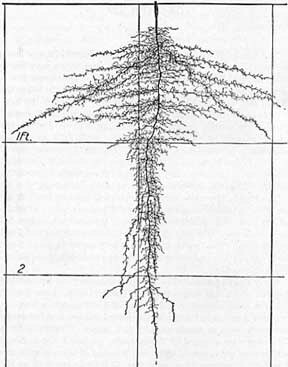 The difficulty of the roots in penetrating the stiff subsoil was shown by the characteristic and abrupt kinks and turns and often zigzag course of the taproots and by both large and small laterals. A study of Fig. 42 gives a fair conception of the thorough occupancy of the soil by the turnip root to the working level at 3 feet. The turnip taste was noted even in the youngest rootlets. Mature Plants.--A final investigation was made Oct. 5. The plants were practically mature. They had a height of 8 to 10 inches, a spread of tops of 15 inches, and 10 to 12 leaves each. The leaves averaged 13 inches long and 5 inches in width, thus presenting a very large area. The fleshy portions of the roots were not well developed, the greatest diameter being only 3 inches and the long axis about 4 inches. Rootlets arose from the lower half of the "turnip" in two opposite rows. The larger rootlets were never very abundant. Only 3 or 4 per plant exceeded 1 millimeter in diameter, and these were only 6 to 8 inches long but densely branched to the third order, The rest constituted little tufts of hairlike roots, often 5 to 10 arising in a cluster at the rate of 5 to 10 clusters per inch. These were so densely branched and rebranched as to constitute a root network in the soil. Below the enlarged fleshy part, the taproot tapered to only 0.5 inch in diameter at the 12-inch soil level. A maximum depth of 5.5 feet was ascertained for several plants. Not infrequently the taproots divided in the hard subsoil at depths of 3 to 4 feet into two to four strong branches. These often spread a few inches and then pursued more or less parallel but tortuous downward courses. The newer and deeper portions of the taproot, which had grown since the July examination, were very profusely branched. They were quite similar to the portion in the second and third foot of soil at that examination (Fig. 42), although the branches were somewhat longer. The origin of the white or slightly yellowish laterals from two rows on opposite sides of the main root was very characteristic throughout. Briefly, the chief developments of the root system since the last examination were as follows: The numerous laterals from the shallower portion of the greatly enlarged taproot and its more superficial, horizontal branches quite filled the surface soil. The lateral spread had reached a distance of 2 to 2.5 feet on all sides of the plants. The marked growth of the taproot into the deeper soil had been accompanied by a similar growth of many of the vertically descending, major branches. Thus the soil all about the plant was thoroughly occupied by a dense network of roots to the working level at about 5 feet. The degree of branching was even greater than before; even the deeper soil (below 3 feet) was literally filled with cobwebby networks of delicate rootlets, the ultimate branchlets of which were exceedingly numerous. Thus the turnip had developed a wonderfully efficient absorbing system. Root Development the Second Season.--The root development of the Purple Top Globe turnip at the time of flowering was studied at Norman, Okla. Plants were grown in rows 3.5 feet apart. The seed was planted about midsummer and root studies made May 1 of the following season. Early in March the plants were thinned to 2 feet apart in the rows. Earlier investigations had shown that new root growth had started and was well under way by Mar. 9, synchronously with the new growth of tops. 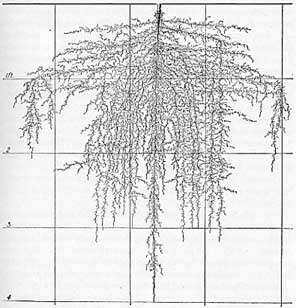 This consisted of an abundance of young rootlets 0.2 to 1 inch in length originating from the taproot and the older portions of its major branches, Moreover, it was found that practically the entire root system had survived the winter, the soil moisture being very favorable and soil temperatures not extremely low (see Table 9, Chapter I). On May 1 the plants had just completed flowering. The death of most of the basal leaves and the smaller size of the cauline ones had greatly reduced the transpiring area. The latter, however, were quite abundant on the 10 to 17 strong branches per plant. A rapid deterioration and death of the plants after seeding was observed. The strong taproots pursued a very tortuous downward course to depths of nearly 4 feet. In the first foot of moist, fertile soil 58 branches 0.5 to 1.5 millimeters in diameter originated. These ran horizontally outward 20 to 41 inches and ended in the surface 12 to 16 inches of soil without turning downward. Six other branches were traced outward and downward, their courses being somewhat parallel to that of the taproot. In addition, there were exceedingly numerous small branches arising from the taproot and the fleshy portions of the major laterals. These varied from 800 to over 2,000 in number depending upon the size of the root and the number of larger branches. They were fewer where larger branches were-more numerous. Approximately one-third of these were 9 to 18 inches long, the others were shorter. Most of them had appeared since the March examination when only 200 to 500 roots of this type were found. Although some were simple, they wore usually well branched. Branching on the major laterals was profuse. A rate of 15 to 24 thread-like branches per inch was not uncommon. Some of these were 9 inches long and profusely rebranched. In places as many as 86 rootlets 1 to 3 inches long were found on a single inch of main root. In general, the laterals pursued a path at right angles to the root from which they arose. In the second foot of soil a total of 15 larger laterals 8 to 24 inches in length occurred. There were in addition 12 to 20 smaller roots on each inch of the taproot. The larger ones, in the first foot of their course, gave rise to 1 or 2 major branches '12 to 15 inches long, and 6 to 15 smaller ones 0.5 to 3 inches long. Branching in the third foot of soil was only slightly less pronounced, several strong laterals originating at this level. Even in the fourth foot well-branched and rather numerous root termini were found. The larger, longer laterals and their greater abundance is believed to be due to the sandier nature of the soil here than at Lincoln. As a whole the roots of the turnip form an extremely intricate network and thoroughly ramify the soil, rather completely exhausting it of its supply of water. The older roots were yellowish in color, the younger ones and the root ends were white. Summary.--The turnip has a pronounced taproot which elongates at the rate of 1. 2 inches per day during the first few weeks of growth. In the surface foot of soil most of the branches, few of which are near the soil surface, extend horizontally but those originating at greater depths very early show a tendency to turn downward. Plants only 3 weeks old have taproots over 2 feet in length from which an extensive and profusely branched absorbing system is soon developed. Forty-day-old plants extend their taproots to the 4-foot level. Lateral spread in the surface foot reaches 2 feet, but the surface 4 inches of soil is poorly occupied. Thus in a period of 17 days the depth and lateral spread of roots have been nearly doubled. By a turning downward of the horizontal roots and a marked growth of more oblique ones, all of which originate in the surface foot, the second and third foot of soil are also exceedingly well occupied. Short branches form a dense absorbing network along the path of the taproot. Mature plants are rooted 5.5 feet deep and have a lateral root spread of 2 to 2.5 feet. By vigorous growth of the numerous vertically descending major branches, the working level has been extended to 5 feet. Thus a soil volume of 100 cubic feet is thoroughly ramified (but in the surface 3 inches near the plant only) with an extremely extensive and delicate system of ultimate, absorbing rootlets. In more sandy soil and during a second year of growth the same variety reaches a depth of about 4 feet, develops an extensive, absorbing network in the surface soil, and has a more horizontal spread of branches throughout. Moreover, the secondary branches are much longer and ultimate branches far more numerous. Washing the clayey subsoil, such as occurred here, from roots as delicate as those of the turnip, would not enable one to gain an accurate idea of their full extent. This probably accounts in part for these findings. Root Development in Relation to Cultural Practice.--A study of the very extensive root system with its extremely delicate network of ultimate branchlets explains why turnips thrive best in a deep, rich, moist loam soil and why the soil should be kept in excellent tilth. As with other root crops, such as carrots, beets, and parsnips, a soil that is easily moved by the enlarging fleshy portion of the root is essential; otherwise the roots are very likely to be misshapen and irregular in growth. Heavy clay, for example, crusts of which sometimes form after rains and pinch off the plants, not only increases the difficulty of securing a stand, but root penetration is hindered. Root crops are removed from such soil with considerable difficulty. The effect of soil environment, as it may be modified by the grower, on the growth of roots of vegetable crops deserves much more study. For example, the effect of phosphates in promoting root growth in length and number of branches has long been recognized in agricultural practice. They stimulate root development in the early stages of plant growth, and under some conditions are used in large quantities in the growth of turnips and rutabagas. It would seem reasonable to conclude that the larger the feeding surface at the disposal of the roots the less exhaustive is the crop on the soil, since the food materials would not be gathered from the surface area only. Nitrates, on the other hand, when added to the surface layers of soil, stimulate the production of masses of shallow roots and tend to inhibit root elongation. This would appear to be detrimental to normal crop growth in regions where these layers have very little or no available water during periods of drought, since under these conditions the roots cease to absorb and may die. The usual spacing of turnips in rows 10 to 18 inches apart and thinning to 6 or even 12 inches in the row result in very considerable root overlapping and underground competition. Shallow tillage conserves the supply of water without root injury and enables the roots to absorb in the surface layer of soil which is usually the richest in nutrients. The large yields often afforded by turnips (600 or more bushels per acre) are produced during only a few weeks of growth. Thus the root system must absorb vigorously to supply water and nutrients to this end.